Earlier this month, both the Standard and NTV reported that farmers in Kenya were having difficulty buying subsidized fertilizer. In Kenya, fertilizer is available to small farmers from the government at subsidized prices. For example, 50kg of Diammonium Phosphate (DAP) is available at Sh2,500 ( around $25US ) subsidized. If purchased from private traders, it would cost between Sh3,500 ( $35US) and Sh3,700 ($37US). However, these subsidies are only available if the fertilizer is purchased from the National Cereals and Produce Board(NCPB) a Kenyan government run company. The fertilizer was only available at certain NCPB locations forcing farmers to travel significant distances and stand in long lines. Kenya’s government only allows small farmers to purchase subsidized fertilizer and the lines were likely exacerbated by the need to produce paperwork. However, more recent thinking on food subsidies has changed. Malawi, after following international recommendations to eliminate fertilizer subsidies, faced widespread food shortages in 2005 after a disastrous harvest. Determined not to repeat this, its government began instituting fertilizer subsidies and has enjoyed record harvests. * Pointing to Malawi’s success, some Western economists such as Jeffrey Sachs now advocate fertilizer subsidies in Africa. In a notable difference from the Kenyan approach, the Malawi government issues farmers coupons that can be used to purchase fertilizer from private merchants at the subsidized prices rather than selling the fertilizer directly. However, Malawi’s policy is expensive — running as high as 16% of GDP in 2008. Even these Western countries that have pushed Africa to embrace laissez-faire economics and eliminate fertilizer subsidies, extensively subsidize their own agriculture. So, African government that subsidize fertilizer are following the policies that the West practices rather than what it preaches. I love music from Mali. I looked into how the country’s musician’s were responding to war. In Egypt, How Free Is Free? Egypt is experiencing a suite of problems at the moment. Economic hardship, political discourse and constant violence rattle the day-to-day lives of its citizens, even though the revolution supposedly ended two years ago. Freedom of speech and of the press has been one of these hot-button issues, with activists and journalists brought in for questioning on the grounds of defamation. On March 31st, popular comedian Bassem Youssef joined the ranks of the summoned for commentary on his TV show “El Bernameg” (“The Show”) similar in format to the United States’ “The Daily Show.” Youssef had taken on the government, and it started to feel uneasy about his jabs. After the show, the US Embassy in Cairo tweeted the segment to its followers much to the chagrin of the Muslim Brotherhood and the ruling party. But activists commended the Embassy for their bold stance. Unfortunately, some things were not to be. The MB quickly countered, condemning the move. Promptly, not only the offending tweet, but the entire @USEmbassyCairo account was taken down. Allegedly this was done without White House approval and soon after, the account was re-instated–minus the original tweet. The next day, the MB continued a barrage of attacks on US policy and relations with the US, both on Twitter and their website. Morsi also released a statement (in English) regarding the incident. The President claimed that the accusations brought against Youssef were from a private citizen, and not the government. “Egyptian Presidency Press Release on the Questioning of the Comedian The Presidency reaffirms that Egypt after the revolution has become a state of law with independent Judiciary. Hence, the Prosecution’s summoning of any Egyptian citizen regardless of his title or fame is the decision of the Prosecutor General, who operates independently from the presidency. The current legal system allows for individual complaints to be brought to the Prosecutor General. All the current well-publicized claims were initiated by citizens rather than the Presidency. 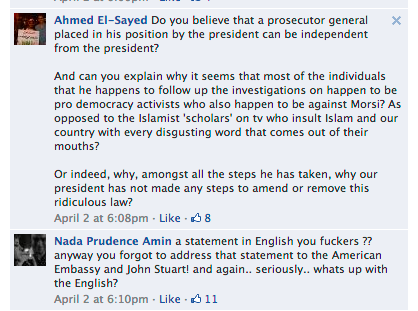 The Presidency has not filed any complaint against stand-up comedian Basem Yousef. The Presidency reiterates the importance of freedom of expression and fully respects press freedom. All citizens are free to express themselves without the restrictions that prevailed in the era of the previous regime. The first legislation passed under President Mohamed Morsy was concerned with the prevention of pre-trial detention of journalists. This demonstrates the determination of the President to encourage press and media to operate in a free environment. We urge citizens to exercise their legal right to freedom of speech while respecting the rule of law.” People questioned it’s motive, considering it was written for a western audience. The Twitter-verse was aflame with support for Youssef and his message. The post became its own center for debate, even being challenged by a fellow HuffPo blogger. Oddly enough, Youssef himself encouraged a redirection of this energy, claiming that others were more deserving and in more need of the attention. The conversation was so popular, #BassemYoussef, #Cairo and #Egypt all became trending topics on Twitter. Later in the week, after Youssef’s showed aired, #BassemYoussef would again rise to the same level of attention. “He is constantly attacking Islamists. Before he used to attack everyone but now he is constantly attacking Islamists”. On Friday night, Youssef’s show aired as scheduled, and the media personality was unphased by his recent arrest. In the show, he took on Qatar with a parody that would go viral later that night. In general, activists were elated to see the comedian continue to “fight the good fight” against the oppression they felt against the regime. The next day, Youssef was officially acquitted of charges and the investigation was dropped. That wasn’t the end of the story, though. And this sentiment wasn’t limited to the government or the Business Council. Several citizens of the island also spoke out on Twitter, offended by the comedian’s commentary. For a land as impoverished and desperate as Egypt, the push and pull of old-world and new-world values could prove fatal to many of its citizens in this ongoing struggle for democracy. I curated over 800 equality memes. See the result here. I put together a bunch of Vines shot by people who went to the Red Sox Opening Day on Monday. I found that there were things Vines were great for, and some Vines were really impossible for. Songs! People like singing at baseball games, and it’s great to actually hear and see people singing. The flyover: People like fast planes. You can even enjoy Vines on the flyover without the sound turned on. Watching the actual game: Again, another Vine you can watch and enjoy even without the sound. Actually learning about what happened in the game: I didn’t see a single Vine that had the score in the caption. I had no clue what the final score was (although I knew the Red Sox had won). Here’s a screenshot of how my Vineyard of Red Sox looked like (prototype running locally on my laptop — I’ll try to do a demo in class since screenshots of Vines is kind of sad…). I tried to limit myself to posts only by people rather than publications or organizations. I also tried to use information only contained in the post itself, rather than allowing myself to click-through a given link to get more info. This made it easy to curate the emotion around Ebert’s death, but hard to learn any actual information about his life. I made a Storify from tweets of people at Bradley Manning’s pretial hearing today. You can find it here or below. #OpIsrael: Anonymous takes on Israel, again. When I opened my computer on Sunday morning, my twitter feed was overrun with messages about #OpIsrael. The hacker’s collective Anonymous had targeted Israel for the second time–the first being in November of last year–with the aim of “wiping Israel off the Internet”. While the nation’s sports fans were inflicted with March Madness, a different sort of mania swept New York basketball fans as the Knicks came off their 13th win in a row last night to clinch the Atlantic Division title, the first for the franchise since 1994. My sources include tweets and Facebook posts mentioning the Knicks, the NBA and various Knicks players, the Twitter feeds of sports news outlets and basketball blogs, and YouTube videos mentioning the Knicks. These sources yielded some photos that were “actualities”– taken and posted by fans actually present at the game. However, the bulk of content (articles, posts, videos) still ended up being accounts written by professional journalists, and shared across the web. Anne Crosby on Hi! I’m Aileen.